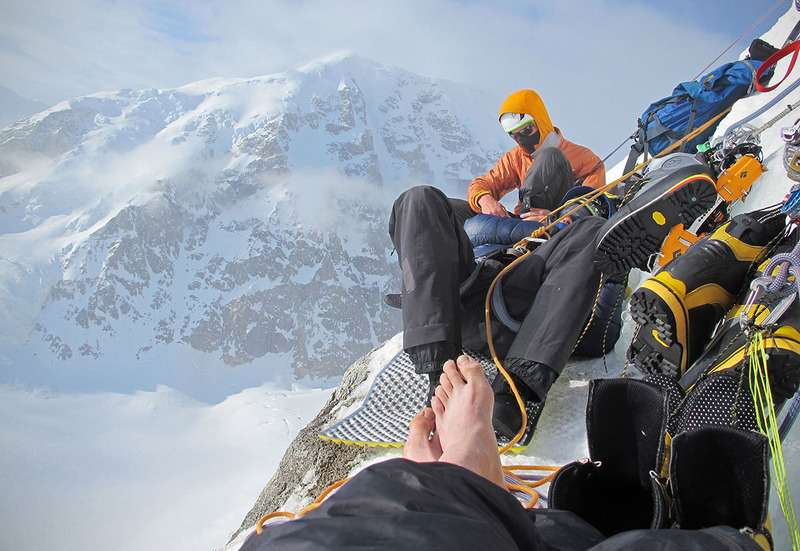 No piece of gear is more critical to summiting high peaks than footwear. A great mountaineering boot fills countless roles: it must offer support while carrying heavy loads, grip confidently over slick rock and snow, keep your feet warm when the mercury dips, and allow for the attachment of crampons and skis. But most importantly, it must instill trust and confidence. Our picks for the best mountaineering boots of 2019 below are broken down into three categories: extreme cold/high altitude boots for the world’s tallest mountains, 4-season technical alpine boots for keeping your feet warm while moving fast and light, and lightweight mountaineering boots for less technical and lower elevation routes. For more background information, see our buying advice and comparison table below the picks. Weight per pair: 3 lbs. 15 oz. What we like: A highly versatile and remarkably comfortable boot that is lighter than competing models. Comes in both men’s and women’s sizing. What we don’t: Leather absorbs water more readily than synthetic boots, and weight savings come at the expense of durability. La Sportiva’s Nepal line has been the standard bearer for technical single mountaineering boots for nearly two decades. There have been several iterations over the years, but the concept has stayed largely the same: a durable leather boot that excels across the spectrum of mountaineering. These boots have kept guides’ feet warm on Mount Rainer, are more than sufficient for all but the coldest days of kicking up dry ice in the northeast, and should perform just fine on late April and May trips to the lower peaks in the Alaska Range. You can even bust out a few rock moves when needed thanks to the rubber toe. 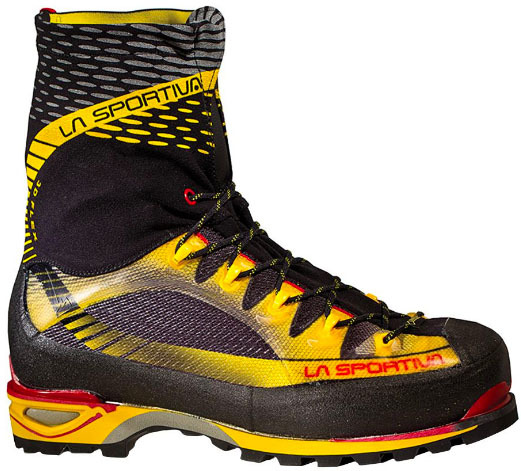 And La Sportiva upped the ante on their Nepal line when they introduced the Nepal Cube GTX. Coming in more than 8 ounces lighter than the Nepal EVO for the pair, the Cube GTX still retains its predecessor’s technicality and jack of all trades prowess. La Sportiva stripped the EVO’s heavier construction in places like the Vibram rubber rand, adding an air-injected rubber rand instead. While this does indeed lighten the boot, it also reduces durability slightly. And one of our favorite features is the removable tongue, which can be moved up or down (or even removed entirely) to add padding and or make more space. If durability or cost is your most important consideration, we would instead recommend the La Sportiva Nepal EVO ($510, 4 pounds 7.4 ounces), Scarpa Mont Blanc Pro GTX ($525, 4 pounds 0 ounces) or Lowa Weisshorn ($490, 4 pounds 4.6 ounces) below. Otherwise, the Nepal Cube GTX will give you the warmth and support you need with less weight. Weight per pair: 6 lbs. 3.7 oz. What we like: A premium and time-tested high altitude boot that is like an oven for your feet. What we don’t: Insulating Vibram PE sole is less durable than conventional rubber. 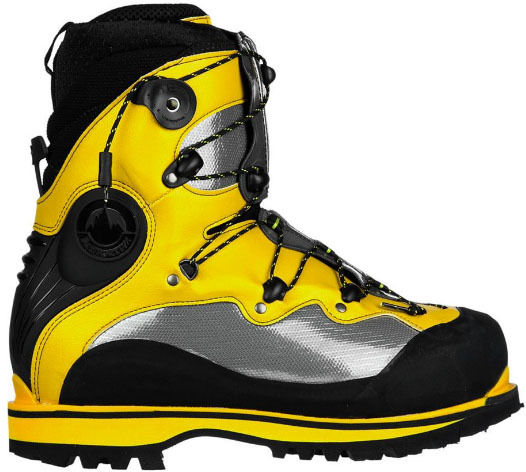 The La Sportiva Olympus Mons is perhaps the most popular double boot on the market for extreme cold. 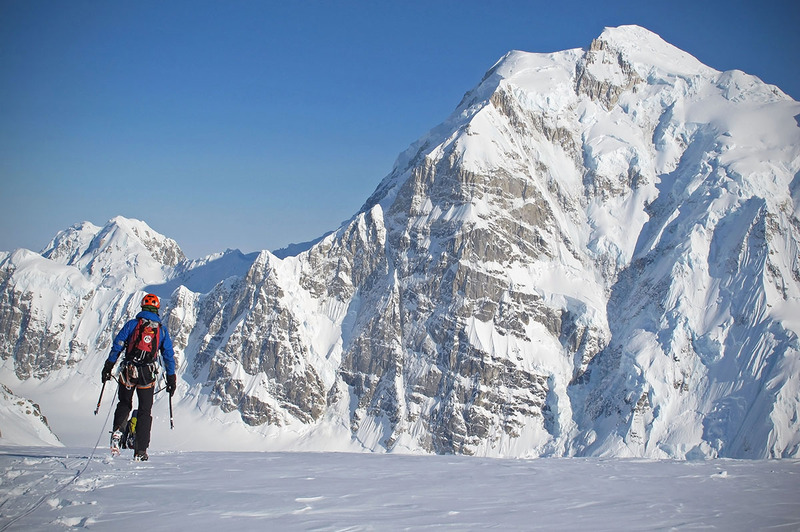 It’s the go-to model for mountaineers looking to stay warm in extreme places like Denali’s West Buttress, Mount Everest, and Antarctica’s Mount Vinson. The uber-comfortable polyurethane thermal-insulated inner boot accommodates a wide range of foot sizes, and the one-handed lacing system with a Velcro closure doesn’t require any tying (perfect for tightening with big gloves or even mittens). A similar system tightens up the outerboot before a durable zipper and Velcro strap seal off your feet from the frozen elements of the world’s biggest mountains. The biggest downside of the La Sportiva Oly Mons is that it achieves a significant amount of underfoot warmth from the unique insulating Vibram PE sole. This is the softest rubber of any double boot on the market, so fragile that the boot is designed to be worn consistently with crampons. If you do a lot of walking on sharp rocks without crampons (think Aconcagua, for example), you will notice quicker wear on the boot. La Sportiva does address this issue by having a full-strength rubber toe, so for most snow and ice mountains like Denali, durability won’t be an issue. In addition, the Oly Mons is a bit heavier than the Scarpa 8000 below (5 pounds 12.4 ounces per pair), although the difference is minor. In terms of fit, many people recommend going up at least one full size. Weight per pair: 3 lbs. 6.4 oz. What we like: Great price point, rocker is suited for long approaches, lightweight, comes in both men’s and women’s models. What we don’t: Not super durable or warm due to the lightweight fabrics. The Scarpa Charmoz is a go-to option when you need one piece of footwear to get you from the car to the summit. From long approaches through tree line to crossing glacier-polished granite slabs and cramponing up icy summit pyramids, the Charmoz will keep your feet dry and agile. It is decidedly a three-season boot—the light insulation, quasi-flexible sole, and high rocker mean that the Charmoz is not an ideal choice for technical ice climbing or mountaineering in cold conditions. 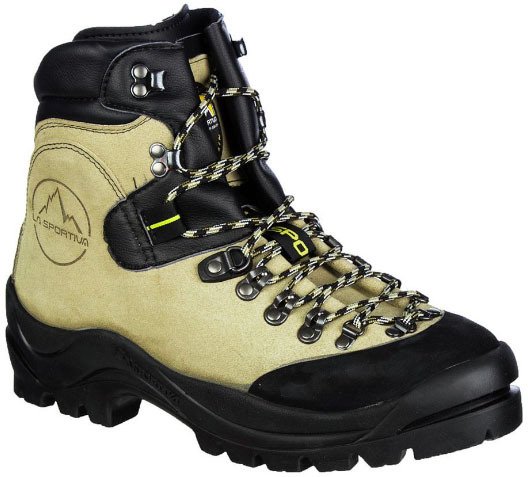 But for spring and fall weekend missions into the Cascades, Bugaboos, Rockies, or Sierra, it is an excellent boot. At just over 3 pounds for the pair, the Charmoz is slightly heavier than the La Sportiva Trango Cube GTX but feels a little more durable. And at just $325, the Charmoz is $65 cheaper than the Trango Cube, although it does utilize an OutDry waterproof liner instead of a more proven Gore-Tex insert. As with many boots in this weight class, the lack of a toe welt means that the Charmoz will not take step-in crampons, although it is compatible with semi-automatic crampons. On a recent climbing trip to Nepal, our tester was very satisfied with how well the Charmoz hiked on trails and kicked up scree on a 5,200-meter pass. If covering miles and vertical versatility are what you are looking for, this is our favorite lightweight boot. Weight per pair: 3 lbs. 8.4 oz. What we like: Great warmth-to-weight ratio, waterproof, highly technical. What we don’t: One of the more expensive boots in its class. Scarpa’s entire Phantom line looks so similar that it can be hard to tell the Tech apart from the 6000 and 8000. In sum, the Tech is the racecar of the Phantom line and one of the most popular boots among ice climbing guides. Given how light it is at just 3.5 pounds, the boot packs an astounding amount of warmth. And unlike the leather single boots in this round-up, which come up a little higher on the shin, this synthetic technical boot stops just above the ankle. This fit not only lightens it up, but also allows for more ankle articulation for precision placements on ice and mixed pitches. Like the bigger boots in Scarpa’s Phantom line, the wrap-around zipper can take a little time to get used to, but once we did we really liked it. In terms of competitors, the Phantom Tech is similar to the Arc’teryx Acrux AR and La Sportiva G5 in warmth, weight, and features. The G5, however, does not have a waterproof zipper, which can make a big difference on approaches where you have to splash across creeks or on warm days when snow and ice takes on a wetter quality. 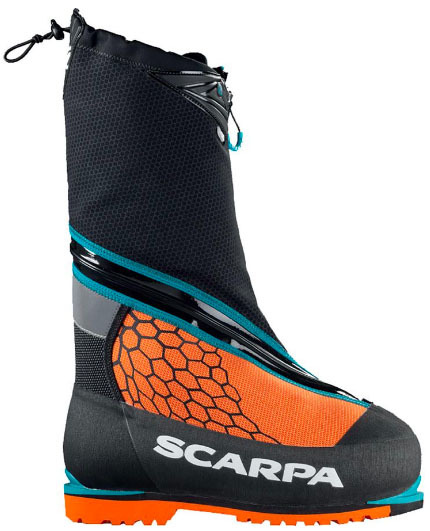 Accordingly, Scarpa wisely put a waterproof zipper on every boot in their Phantom line. For a technical climbing boot that is warm, durable, and performs extremely well on steep terrain, the Phantom Tech is a great choice. Weight per pair: 4 lbs. 6 oz. What we like: Simple but effective lacing system, watertight zipper, technical fit. What we don’t: For those with narrow feet, the wider fit in the heel and toe box may reduce the boot’s technical prowess. Of all the technical double boots on this list, the Scarpa Phantom 6000 offers the best performance, construction, and feel. This is Scarpa’s go-to model for giant ice routes in the Canadian Rockies and technical Alaska ascents, and we feel confident in saying that it’s also a great option for many mid-season Denali climbers (Scarpa’s Phantom 8000 is even warmer, but significantly heavier). At only 4 pounds 6 ounces for the pair (size 42), the Phantom 6000 is the lightest in its class—a hair lighter than the La Sportiva G2 SM, and more than 1 pound lighter than La Sportiva’s technical machine, the Spantik. In terms of construction, a PrimaLoft Micropile insulated liner provides ample padding and warmth, with a basic Velcro closure on the outer side. 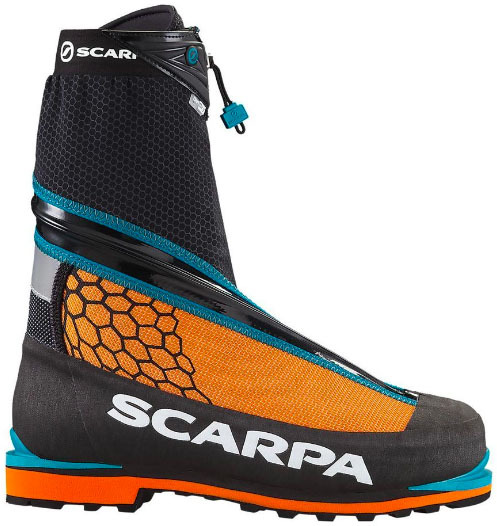 Scarpa shaved weight from the previous orange Phantom 6000 by replacing the rubber rand with a molded foam rand, which likely will not be as durable in the long run. More, the wrap-around zipper concept can feel weird at first, but we appreciate the fact that this design almost entirely protects the zipper from being scuffed by the passing point of a crampon. We found the heel pocket to be a little broad on the Phantom 6000, although a pair of thick socks helps to tune in the fit. And unfortunately, this boot only comes in full sizes. Although Scarpa’s footwear is known for being wider than La Sportiva’s, we felt that these boots fit very similar to the La Sportiva G2 SM. Weight per pair: 4 lbs. 5.1 oz. What we like: Low-profile design for such a warm double boot. What we don’t: Narrow design may not accommodate wide feet as well as other brands. When Arc’teryx designs something, they typically go bold, and the Acrux AR mountaineering boot is no exception. Sleek and black with just a slight hint of red, the Acrux AR looks like it could kick a mountain to pieces and come away without a scratch—of all the options on this list, it may be the most durable. The Acrux AR has very few seams, which are known to be points of weakness in mountaineering boots. A fully waterproof zipper protects the Gore-Tex lined inner boot, which resembles a thick and stretchy sock. We were somewhat surprised by the simple lace design (a pull-down cinch design would be nice), but a lateral Velcro strap provides some additional stiffness above the ankle. 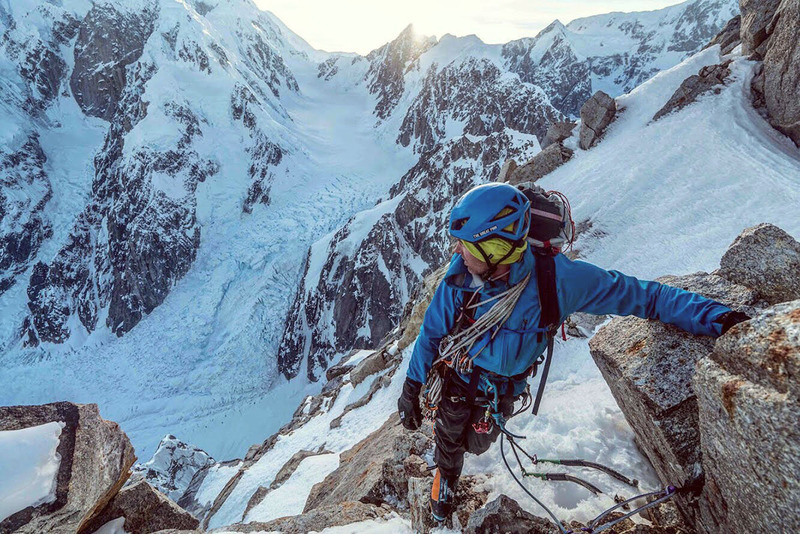 In terms of best uses, the Acrux AR will excel at everything from ice climbing in the Canadian Rockies to alpine-style ascents of lower mountains in the Alaska Range. 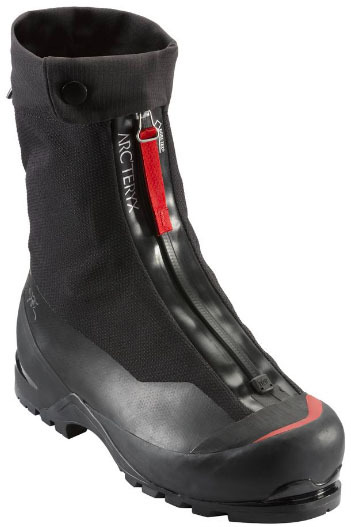 Although Arc’teryx calls the Acrux AR a double boot, it’s less so than the Scarpa 6000 or La Sportiva Spantik. 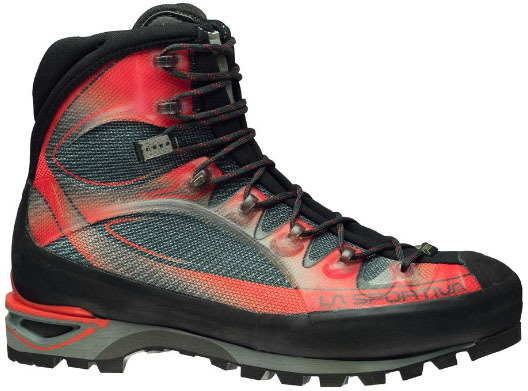 In fact, this boot is closer in warmth, weight, and technicality to the La Sportiva G5 and Scarpa Phantom Tech. We also found the Acrux AR has a narrower fit than the G5. Overall, if the Acrux AR fits your foot and price range, we feel confident that this stealth boot will propel you across wide glaciers, up steep drips, and onto many remote summits. Weight per pair: 3 lbs. 5 oz. What we like: Lightweight and exceptionally well-built. What we don’t: Toe piece does not accept automatic crampons. Lowa might not be the most well-known brand in the U.S., but the European company has been making high quality, alpine-oriented footwear for decades. Released last year, the Alpine Pro GTX is eye-catching in its versatility: it’s one of the lightest boots on our list—second only to La Sportiva’s Trango models—but sports a full shank and offers a noticeable bump in warmth from a standard lightweight mountaineering boot. All in all, it has much of the hiking comfort and scrambling sensitivity that we love about the Scarpa Charmoz above, but with the protection and warmth of a 4-season boot. In terms of durability, the Alpine Pro has held up under testing far better than the similarly versatile La Sportiva Trango Ice Cube. The lack of toe welt on the Alpine Pro GTX means that it’s not compatible with step-in crampons, an omission that may steer some ice climbers away. However, we found the Lowa to be so savvy that on technical ice that its feel is comparable to our top pick, the Scarpa Phantom Tech. In fact, paired with step-in hybrid crampons like the Petzl Lynx, it was our go-to boot on a recent climb of Bridal Veil Falls, a classic WI5+ in Telluride, Colorado. And while the streamlined sole certainly doesn’t provide as much warmth as a boot like the La Sportiva Olympus Mons, the Alpine Pro is equally as warm as the Phantom Tech or any of the boots in Sportiva's Trango lineup, and was able to keep our tester’s feet toasty in temperatures as low as 10 degrees Fahrenheit. All in all, for a very reasonable $425, the Alpine Pro is an attractive choice for cold outings high in the mountains when a semi-automatic crampon is sufficient. Weight per pair: 5 lbs. 9.4 oz. What we like: Great price point, fits a wide range of feet, warm. What we don’t: More of a comfort fit than a performance fit—a little heavier than the ultra-technical and modern double boots on this list. The Baruntse is the most durable double boot in La Sportiva’s lineup. Compared to ultra-modern double boots like the Scarpa Phantom 6000 and La Sportiva Spantik and G2 SM, the Baruntse doesn’t offer the shiny features and high-tech designs that win gear awards. Instead, it is constructed to take a beating on steep ice and cold mountains and still get the job done. And the boot may not be quite as warm as the aforementioned models, but it’s Alaska-tested and remains a favorite for technical ascents in the Ruth Gorge and high altitude sufferfests on Denali, Aconcagua, and beyond (if climbing early season on Denali, you may want to consider adding a Forty Below Purple Haze overboot for extra warmth). 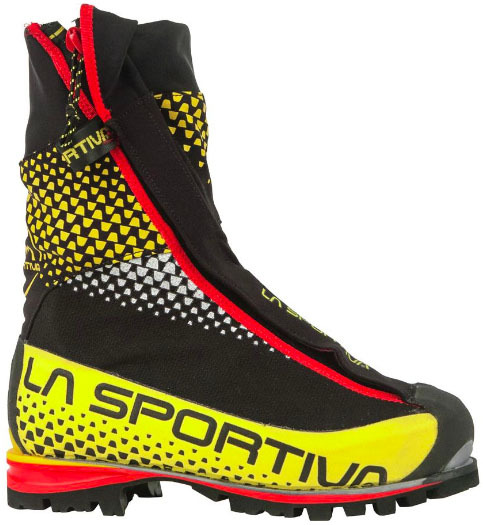 At $625, the La Sportiva Baruntse is relatively inexpensive compared to other double boots. But for the price, you get beefy soles that can be resoled, rubber rands, stout crampon welts, and metallic gussets and eyelets, all of which should stand up to years of abuse. This does come at a weight penalty—the Baruntse is one of the heavier boots on this list at over 5.5 pounds. In terms of fit, the toe box of the liner is a little roomier than La Sportiva’s technical rock-shoe-like fit, which is welcome news for those with wide feet (who would normally tend toward a Scarpa or Lowa). In addition, it’s worth noting that the 7mm thermo-moldable EVA foam liner allows for custom fitting. Some people retrofit this boot with a thicker and even warmer Intuition Denali or Logan liner, which takes up additional room and provides an incredible custom fit for your boot once heat molded. Weight per pair: 5 lbs. 12.4 oz. What we like: Excellent warmth-to-weight ratio, more durable sole than Oly Mons, easy to adjust with big gloves, wider than La Sportiva boots. What we don’t: The most expensive mountaineering boot on the list. The Phantom 8000 is the durable workhorse of Scarpa’s extreme cold mountaineering line. 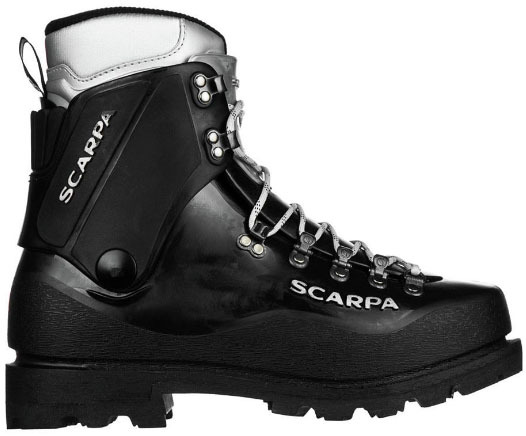 From the ground up, Scarpa designed a serious boot here: an insulated Schoeller upper shell keeps elements out of the boot, while a thermo-moldable liner with a simple pull-down speed lace keeps your foot tight and toasty. More, the Vibram Zero Gravity Lite sole can stand up to the abuse of kicking up scree, unlike the La Sportiva Oly Mons (take this into account if you’re climbing a mountain like Aconcagua). And zippers are always a cause for concern—it only takes one misstep with sharp crampons to shred a zipper—but Scarpa’s method of putting them on the outside of the foot should help alleviate that issue. Why the middle-of-the-pack ranking for the Scarpa Phantom 8000? It’s true that the La Sportiva Oly Mons is slightly heavier at over 6 pounds for the pair, and it’s also true that its sole isn’t as durable as the Phantom’s. But the Phantom 8000 is the most expensive mountaineering boot on this list at $1,100, and we’re not sure if the extra cash is worth the premium sole (as a boot of this caliber will almost always be used with a crampon). But one potential selling point is fit: the Scarpa has a slightly more generous toe box than the La Sportiva, which is great for those with wide feet. Weight per pair: 3 lbs. 13.9 oz. What we like: Great all-around, super durable boot for everything from basic mountaineering to technical climbing. What we don’t: Slightly less rocker than other lightweight boots. 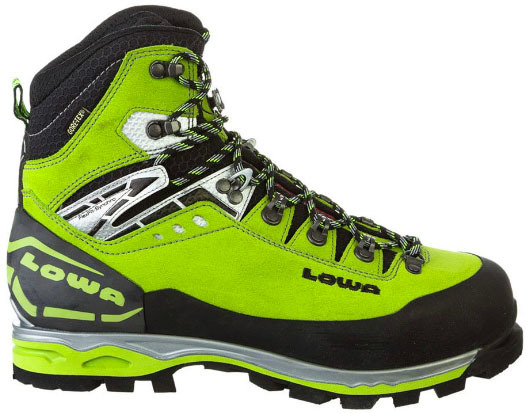 The Lowa Mountain Expert GTX Evo could be considered a classic, and we don’t mean that in a negative way. Other boots in its class shed weight by using lighter materials, often at the expense of durability and a high price tag. New features and technological advances are great, but sometimes you just want something that is hard to kill and can get the job done. Without sporting features like built-in gaiters, fancy lacing systems, or ultralight foam rands and insulation, the Mountain Expert GTX Evo is an excellent do-all lightweight mountaineering boot. 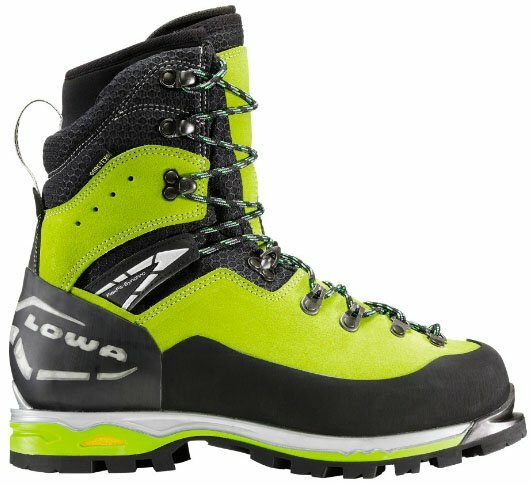 Although the Lowa isn’t the absolute lightest of the fully step-in crampon-compatible single boots listed here, we feel that the benefits of durability, warmth, and a very reasonable price make it a nice choice for a wide range of activities from basic mountaineering to technical ice and mixed climbing. Not only can the Mountain Expert GTX Evo take a beating, but its stiffness underfoot—while still allowing for ankle articulation—make it ideal for steep ice and precision footwork on hairy mixed leads. You do get slightly less rocker than other boots in the lightweight category, but we like the price and performance overall. Weight per pair: 4 lbs. 8.2 oz. What we like: Very warm and comfortable, lighter than the Spantik. What we don’t: Noticeably less stiff, less technical feeling, and less durable than the Spantik/Phantom 6000. The Boa system is hard to repair in the field. The G2 SM was a radical shift in the lineup of La Sportiva double boots, shaving an impressive eight ounces per boot from the already light and technically charged Spantik (the G2 SM did not replace the Spantik, but was introduced several years later as an ultralight and even warmer alternative). La Sportiva went with a dual Boa lacing system (one on the ankle to secure the foot and another on the shin), which allows for quick tightening and adjustments without dealing with tying laces in the extreme cold. And the built-in super gator keeps your inner boot dry and toasty. Compared to the Spantik, the G2 SM is warmer but not nearly as stiff or technical feeling. Even when tightened down, it has a lot more forward flex than the Spantik. This, along with a wider toe box, takes away from the precision fit needed for mixed climbing. And in terms of durability, the G2 SM seems to be slightly less durable than the Spantik or Scarpa Phantom 6000, though neither boot can match its light weight. Overall, the G2 SM excels at cold and high altitude mountaineering on 5,000 to 7,000-meter peaks and is still perfectly capable of climbing highly technical terrain. If weight savings and warmth are your main concerns, the G2 SM will not disappoint. Weight per pair: 4 lbs. 0 oz. What we like: Cheaper than its La Sportiva counterpart (the Nepal EVO), lighter than older model, available in both men’s and women’s. What we don’t: Lacing system does not come up as high on the shin as La Sportiva and Lowa models. 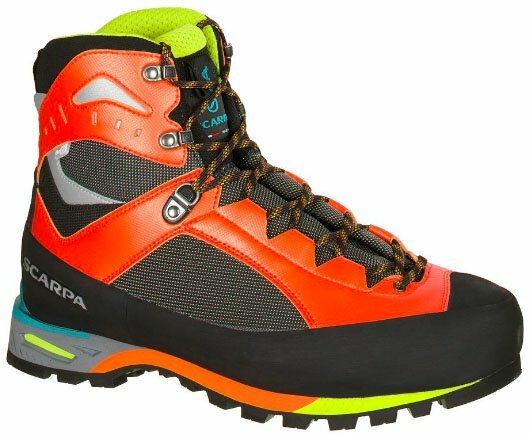 This Scarpa Mont Blanc Pro GTX is a jack of all trades mountaineering boot—it walks well due to the medium rocker (comparable to the Nepal Cube GTX and Lowa Weisshorn GTX), climbs ice well due to the stiffness underfoot and upper boot, and is warm enough to trust for all-season technical climbing and mountaineering. And, it’s a go-to boot for guides on Mount Rainier. But unlike the Nepal Cube GTX, the Mont Blanc Pro GTX lacing system lacks the clamp-down eyelet at the midpoint, a nice feature when you want to keep the lower foot tight but the ankle loose for walking. Despite all of the features, it’s the durable design of the Mont Blanc Pro GTX that really drew us in. From the top down, the boot is constructed of burly fabrics with a minimized profile that doesn’t skimp on functionality. An elastic gator snaps shut with two buttons and stays tight around the calf, and a fixed adjustable inner tongue—somewhat similar to the removable tongue on the Nepal Cube GTX—can be moved up or down to obtain a comfortable fit based on the shape of your foot. Simply put, if the Mont Blanc Pro GTX fits, it will get you up summits and not fall apart on the way back down. Weight per pair: 5 lbs. 9 oz. What we like: Superbly technical feeling boot, easy lacing system, walks great on flat ground but stiffens up for technical climbing. What we don’t: Not as durable as the Phantom 6000, and the liner takes a long time to dry compared to all-foam liners. The Spantik was a revolutionary boot when it came out almost ten years ago, and it remains a favorite among technical alpinists and cold weather mountaineers. The boot has the feel of a technical single boot wrapped up in a super warm double design (it was created before zippers were really popular and instead has a wrap-around closure system on the outer shell). In terms of ability, these boots climb like a dream (for double boots, that is). Compared to the La Sportiva Baruntse or G2 SM, they have a precision fit, and the narrower toe box really allows you to feel your crampons as an extension of your toes. More, the one-hand lacing systems on both the inner and outer boot mean that you don’t even have to take off your mitten to batten down the hatches. In terms of construction, the outer boot is composed of leather uppers and synthetic lowers. Soft foam on the midsole lowers weight and adds warmth, but also reduces durability in one key zone: the heel welt. Unfortunately, the 2mm plastic heel welt (where the crampon lever secures) is built onto this weak, soft foam foundation, and our tester actually had his completely break off while on a climbing trip in Alaska. That said, it’s worth noting that he loved the design of the Spantik enough to purchase a replacement pair. Weight per pair: 3 lbs. 12 oz. What we like: A warm, versatile, and slightly cheaper alternative to the Scarpa Phantom Tech. 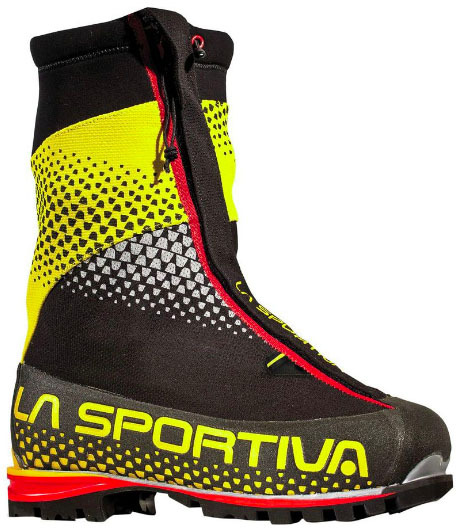 What we don’t: Less waterproof than Scarpa Tech boots, wider heel box than other Sportiva boots. Boa system is difficult to repair in the field. When the La Sportiva Batura hit the market, it was instantly one of the most popular pieces of footwear for ice and technical alpine climbing. The G5 replaced the Batura 2.0 in 2017, shedding nearly 8 ounces from its predecessor, and is a highly technical boot that excels at steep ice and mixed climbing. The Nepal last provides stiffness and support with a Vibram Matterhorn sole for great traction in slick conditions. Like the G2 SM, the G5 uses the Boa lacing system to tighten the boot, and a Velcro strap cinches down above the ankle for additional stiffness. Ultimately, the La Sportiva G5 has a tremendous amount of dexterity and ankle articulation for precision placement while climbing. The G5 undoubtedly is a technical machine and quite warm for its weight, thanks in large part to the insulated gaiter. But it does offer less upper ankle support than boots like the La Sportiva Nepal Cube GTX, Scarpa Mont Blanc Pro GTX, or Lowa Weisshorn GTX, all of which extend higher above the ankle for more rigidity. That said, many technical climbers appreciate the additional ankle flex that is present in this lower profile (similar to the Scarpa Phantom Tech). And the La Sportiva G5 is a significant step up in warmth from the Trango Ice Cube GTX. While we aren’t super excited about the Boa lacing system, we were impressed with the overall construction of this boot. In terms of sizing, our tester found that (like the La Sportiva G2 SM) he had to drop down one-half size from his normal La Sportiva boot size to achieve a good fit. Even then, his sentiments echoed other testers who found the heel pocket to be wide. Weight per pair: 4 lbs. 4.6 oz. What we like: The best price point of all technical single leather boots. High rubber rand increases waterproof capabilities and durability, more rocker than similar boots. What we don’t: Slightly heavier than Nepal Ice Cube GTX. 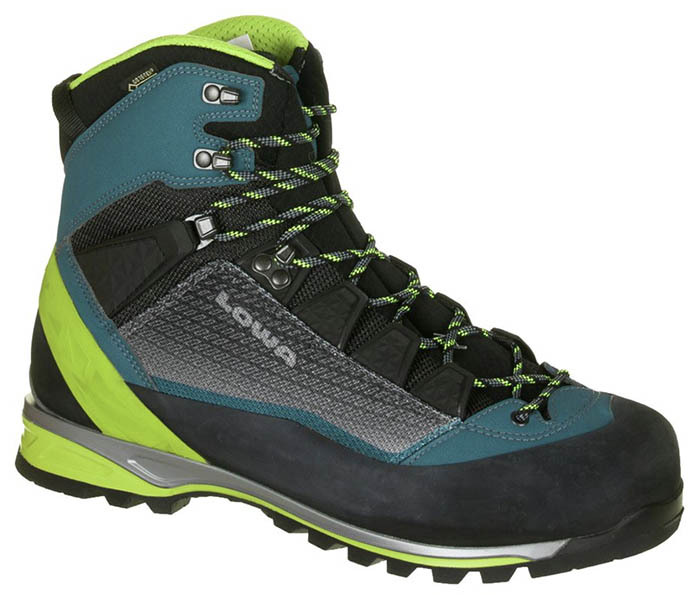 From hunting in Alaska, to kicking up glaciated volcanoes, to ice climbing in Colorado, the Lowa Weisshorn GTX is a true do-everything boot (it’s in the same category as the La Sportiva Nepal EVO GTX and Scarpa Mont Blanc Pro GTX). What we like most about the Weisshorn is its stout build: this boot is a tank and will stand up to years of abuse from boulder fields, scree slopes, and rugged alpine weather. A thick Vibram sole, rigid heel and toe welts, rubber rand, and metal eyelets on the lacing system just make the Weisshorn nearly impossible to kill. Leather mountaineering boots feel like a bit of a dying breed these days, with more bulk and heft than synthetic models, especially when wet. For many, though, these minor gripes are worth it for the comfort and durability of leather. And while the Weisshorn GTX is a touch heavier than Scarpa’s Mont Blanc Pro GTX, it’s actually lighter than the nearly identical La Sportiva Nepal EVO, and the cheapest of the bunch. 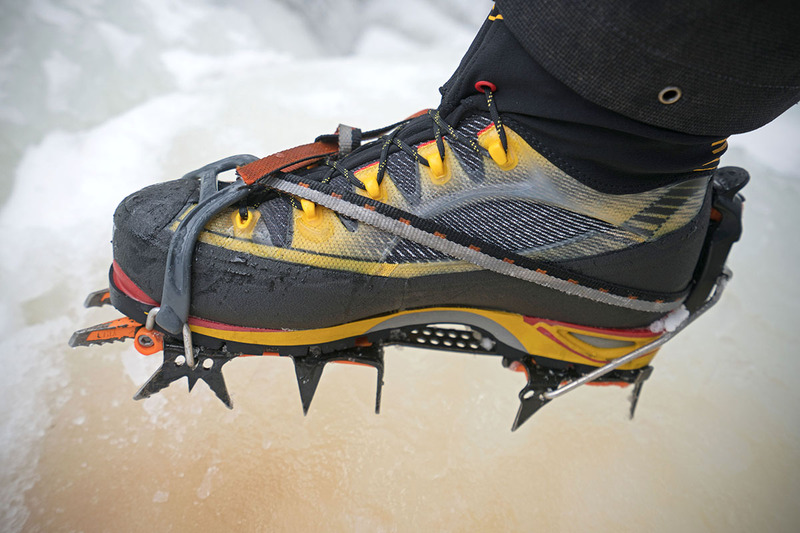 On a recent trip to the Canadian Rockies, it was our tester’s boot of choice for steep ice. And an added bonus: these boots are available in both men’s and women’s sizes, so the odds are good that you can find a comfortable fit. Weight per pair: 3 lbs. 2 oz. What we like: Great for long approaches and Lower 48 climbs. 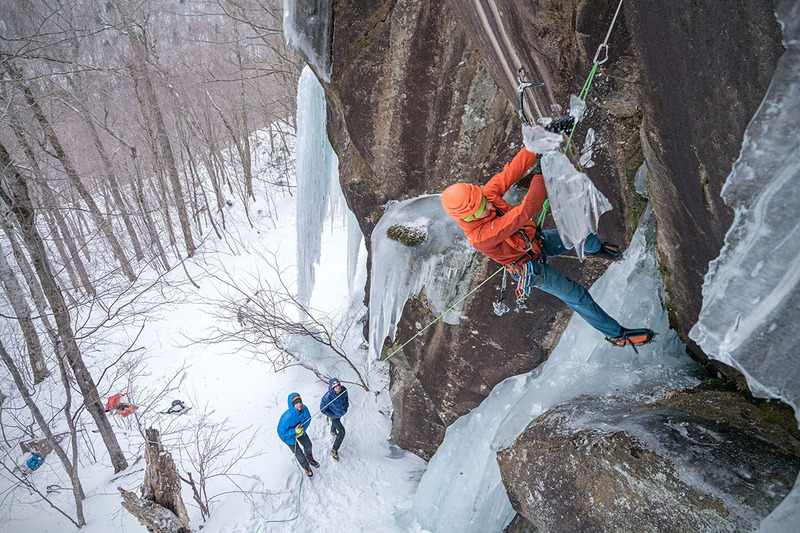 What we don’t: Not incredibly warm, and the 3/4 shank not is meant for technical ice climbing. The La Sportiva Trango Cube GTX is the latest update to the Trango line. “The little red boot,” as it has often been called, has been a staple of low altitude mountaineering for years. In many ways, this is a glorified hiking boot: the Trango has always excelled at thrashing through miles of backcountry trails, doubling as a rock shoe on lower fifth-class terrain, and then kicking up the final snow slopes to some Cascadian summit. These durable little boots are the lightest we cover in this article and can only really be compared to the La Sportiva Makalu below—but the Trango Cube GTX is sleeker and more agile. The Trango Cube GTX got a pretty serious facelift from its predecessor, the Trango S Evo. 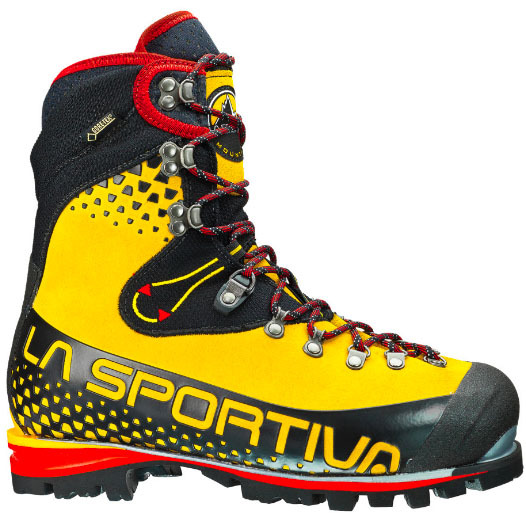 La Sportiva retained the original synthetic design (synthetic materials absorb less water than leather) and beefed up the durability that was an issue with the little red boot of the past. Seams that were once vulnerable are now concealed by a rubberized buffer zone, and sturdy metal eyelets have replaced leather lace grommets. The generous rocker enhances stride on long approaches, while the high gusseted and adjustable tongue keeps snow and rocks from sneaking into the boot. Keep in mind that due to the lack of a toe welt, the Trango Cube GTX does not accept automatic crampons (semi-automatic will work, however). The boot comes in two colors so hunters or hikers wanting an earthier tone can be a little less flashy than their climber brethren. What we like: Classic design for general mountaineering, no frills, extremely durable, cheap. What we don’t: Limited to basic mountaineering, heavier than similar boots. The La Sportiva Makalu is the essence of a traditional mountaineering boot: it’s burly, supportive, and extremely durable. Neither flashy nor technical, this classic design works well for basic mountaineering and possibly as your first real boot. For example, the Makalu is a favorite for National Outdoor Leadership School students since it serves as a combination heavy backpacking and light mountaineering boot. It can trek the length of the Pacific Crest Trail and climb Mount Hood or Mount Saint Helens along the way. Like the La Sportiva Trango Cube GTX, the Makalu is not meant for serious cold weather mountaineering, nor does it offer high-tech materials like Gore-Tex. But it is built to withstand years of abuse on scree slopes and in alpine environments. A Vibram toecap protects the front of the boot when kicking up rocky flanks, toe and heel welts accept step-in crampons, and a full shank provides support under a heavy pack. At $305, this boot still offers an impressive all-around feature set. 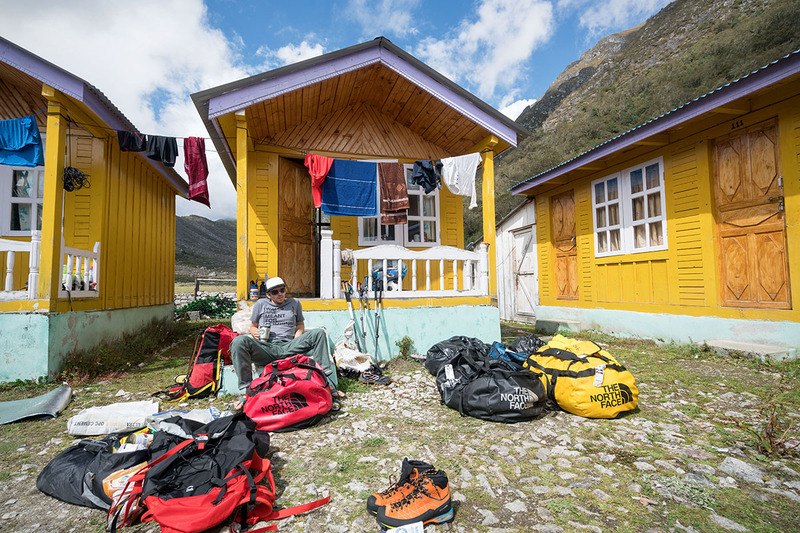 You won’t be pushing the limits of technical climbing in the Makalu, but that isn’t its purpose. Weight per pair: 3 lbs. 3.3 oz. What we like: Highly technical boot in a lightweight package. What we don’t: Plastic eyelets are prone to breaking, thin sole and narrow toe bail are lacking in toughness. On paper, there is a lot to like about the La Sportiva Trango Ice Cube GTX, which is the latest iteration of the classic “Silver Bullet” Trango Extreme (and the insulated and gaitered sister of the Trango Cube GTX). Compared to the older model, the Ice Cube GTX is a lighter, Gore-Tex lined precision boot with a lower profile and even more technical prowess. Despite all of this firepower, this boot tips the scales at just over 3 pounds, which is an incredible feat. This makes the Ice Cube GTX a popular choice for technical alpine routes on coarse granite in places like the Cascades, Rockies, and Patagonia. And if you only plan to use this boot with crampons on snow or ice, it also handles the alpine exceptionally well. The Achilles Heel of the La Sportiva Trango Ice Cube GTX is durability. Our tester trusted his old Trango Extremes to summit Fitz Roy in Patagonia, climb grade 6 waterfalls in Canada, and stay warm on overnight technical ascents in Alaska. He recently put the Ice Cube GTX to the test on Nemesis, a classic Canadian Rockies WI6 ice climb, and although they climbed even better than the Trango Extremes, they were not quite as warm and their lifespan fell tragically short. The gaiter felt like a shoddy afterthought, making entry into the boot awkward. The thin sole and toe welt showed wear and the fixed gator zipper broke after one short trip. And on top of that, La Sportiva substituted plastic shoelace hooks for the previous metal. We want to like the Ice Cube GTX, but these durability concerns are unacceptable for a $550 boot, no matter how light. Until La Sportiva makes some improvements, we recommend considering a boot like the Scarpa Rebel Pro GTX instead. Weight per pair: 5 lbs. 8 oz. What we like: Cheap, nearly indestructible, and time-tested in cold environments. What we don’t: Clunky and not nearly as technically capable as the sleek modern double boots above. More, the stock liner takes a long time to dry. 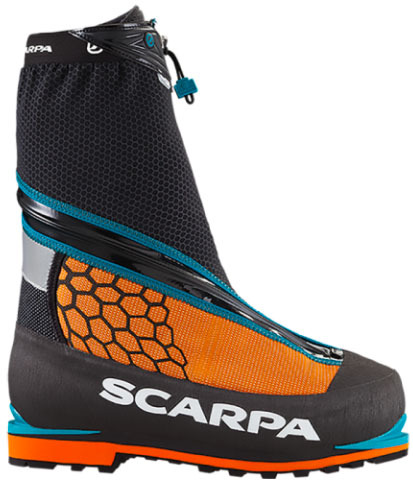 If the Scarpa Phantom Tech is the racecar of double boots, the Inverno is the tank. Plastic double boots largely have fallen out of favor over the last five years, but you can’t beat them for durability—your feet will wear out before the boot does. The Inverno is far less technical in nature than an option like the Spantik or Phantom series, but it will outlast them all. That, and there’s little chance the plastic shell will let moisture seep in. If you plan to use this boot for a cold weather mountain like Denali, we highly recommend that you splurge for the warmer and lighter Intuition liner (keep in mind that this is best done at a specialized mountaineering shop, but many shops will only custom fit boots that were purchased at their store). It’s also highly recommended that you add a Forty Below Purple Haze neoprene overboot if climbing a cold mountain like Denali. When these two aftermarket features are added, the cost-benefit analysis between this system and a boot like the La Sportiva Baruntse above becomes a little less discernable. Regardless, if you aren’t planning on spending much time at freezing altitude or are on a tight budget, the Inverno may be the boot for you. Mountains come in all shapes, sizes, and levels of technical difficulty, therefore it’s imperative that your footwear is best suited for the conditions. For the highest and coldest mountains in the world—7,000 and 8,000-meter Himalayan peaks, Denali, and Antarctica—warmth is the utmost consideration. Extreme cold/high altitude boots are heavy, warm, and commonly take the form of double or even triple boots (with a shell, liner, and fixed gaiter). 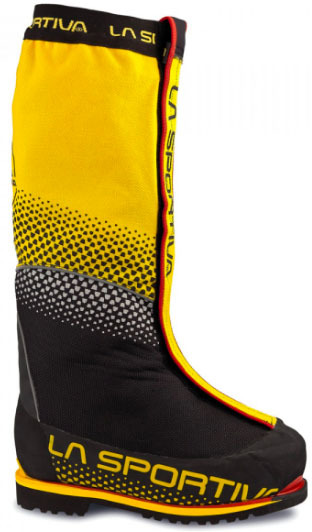 Some, like the La Sportiva Olympus Mons, even have an insulated sole that adds warmth on the underside of your foot. For giant ice routes in the Canadian Rockies, alpine-style ascents of lower mountains in the Alaska Range, and even mid-season climbs of Denali, a 4-season technical alpine boot may be your best bet. These boots are made in both double and single varieties, with the commonality being that they sacrifice the highest levels of warmth for technical prowess (although they can handle the cold, just not extreme cold). 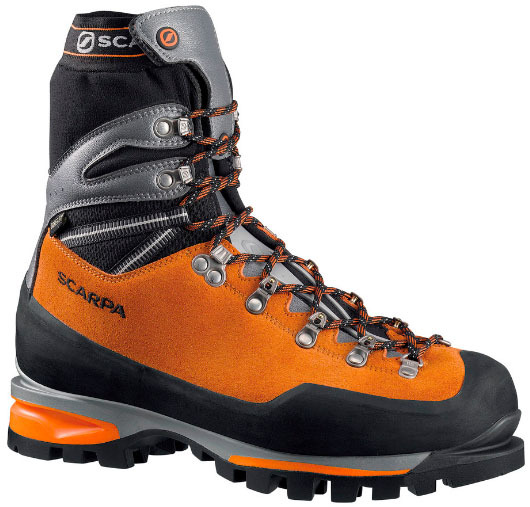 Leading models in this category include the Scarpa Phantom 6000 and Arc’teryx Acrux AR. For lower elevation climbs and more moderate temperatures, lightweight boots should do the trick. These boots are a technical step up in construction from a hiking boot and built to handle long approaches. 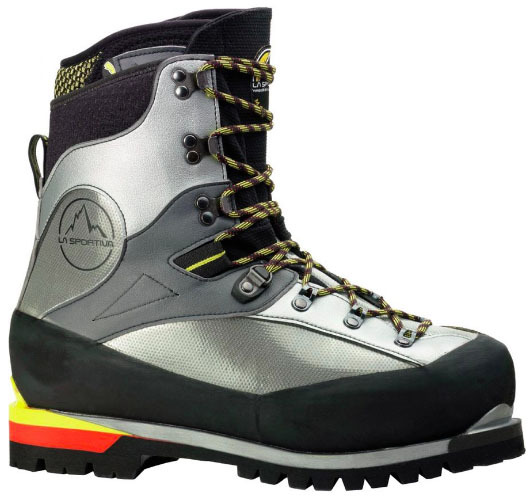 Lightweight single boots are commonly used for trips such as Cascade peaks and volcanoes, a day of ice climbing, or a car-to-summit adventure starting below treeline and ending with basic to moderate mountaineering. 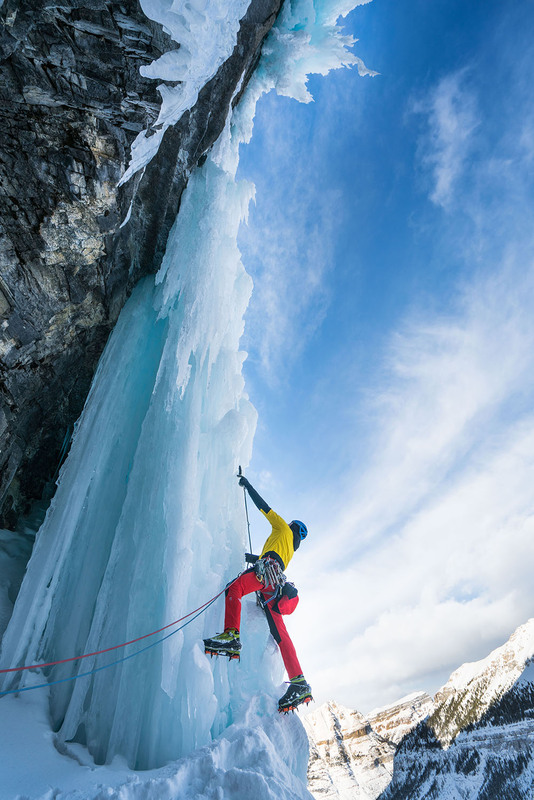 Most are three-season boots with light insulation, a quasi-flexible sole, and high rocker, which means that they are not an ideal choice for technical ice climbing or frigid conditions. Popular lightweight mountaineering boots include models like the Scarpa Charmoz and Lowa Mountain Expert GTX Evo. Nothing is more frustrating or potentially dangerous than cold feet, and toes can go from cold to numb to frostbitten in a matter of minutes. That is why it’s imperative to have the proper boot design for your objective. Single boots lack a removable liner and therefore are the lightest and least warm type of mountaineering footwear. Double boots, on the other hand, have more insulation along with a removable liner, making them warmer and better suited for multi-day trips. The ability to remove the liner and dry it out at night is imperative on big mountains—nothing is worse than shoving your feet into frozen boots in the frigid, pre-dawn darkness of an alpine start. For spring and summer ascents in lower altitude ranges like the Cascades or Canadian Rockies, a single boot should provide enough warmth. It will be light enough to wear on a lengthy approach, but offer enough support to keep your feet comfortable under the weight of a heavy pack. Single boots almost always have more of a next-to-skin feel, meaning they feel more technical and lower profile than their double-walled brethren. Double boots are built for cold weather, multi-day expeditions, and climbing the world’s highest peaks. They often are significantly heavier than single boots and less sensitive overall, but some models like the Scarpa Phantom 6000 and La Sportiva Spantik offer a nice combination of the two (reasonably lightweight boots with technical features). For the tallest peaks and coldest climates—think places like the high Himalaya, Antarctica, and Denali—look toward the top of each brand’s collection. The La Sportiva Olympus Mons and Scarpa Phantom 8000, for example, are built specifically for these types of places. Boot selection is not always a cut and dry choice, as some routes skirt the line between single and double. One of our testers recently spent the Austral Summer in Patagonia climbing outside of El Chaltén. He attempted Cerro Torre in single boots but found that weren’t adequate for the icy flanks of that impressive tower. They were, however, completely sufficient on his ascent of Fitz Roy a few weeks later. On one hand (or foot), having boots that are too hot can cause your feet to sweat, which can lead to blisters and tenderness. But being cold on big climbs can be uncomfortable at best and get dangerous in a hurry. The shell is your first line of defense against the harsh conditions of a mountain environment. It needs to be durable (able to stand up to abrasion from rocks, crampons, and skis), and also must keep out snow, water, and mountain grit. In addition, a lot of a boot’s stiffness comes from the shell, which is important when it’s time to ice climb or do a little survival skiing on the way down. The vast majority of boot shells are now entirely synthetic or a combination of synthetics and leather. If they are made entirely of leather (such as the La Sportiva Nepal Cube EVO GTX or Lowa Weisshorn), adding an aftermarket snow and water seal will help to keep moisture from entering into the boot. Ten years ago, plastic boots were a popular way to go. Compared to soft leather or synthetics, plastic feels more clunky and less precise when technical footwork is needed. But it does have its benefits: not only is plastic significantly cheaper, it’s also much more durable. If you are an occasional mountaineer on a budget or only intend to climb a few mountains, plastic may be a good option. Adding a Denali Intuition liner ($176 plus potential custom molding fees) will make them warmer while dropping almost a pound of weight in the process. For big mountains like Denali, a Forty Below Purple Haze overboot ($170) will be necessary as well, which may require that you purchase a different crampon to fit over the boot. In 2019, however, you will see very few plastic boots on mountains like Denali or any of the popular Himalayan peaks. Synthetic boots weigh less, cinch down tighter, and have enough bells and whistles that they have rendered plastic boots almost obsolete. And if you customize your plastic boot as described above, it will end up costing between $700 and 750, which is roughly the price of a high-end synthetic double boot of equal warmth and superior technical precision. Big mountains require big boots, often with a big price tag. Some of the extreme cold/high altitude models on the list like the La Sportiva Olympus Mons are over 6 pounds for the pair and take up a decent chunk of your duffel bag. On the other end of the spectrum, you can go with a lightweight single boot like the La Sportiva Trango Cube GTX for just 3 pounds 2 ounces total. 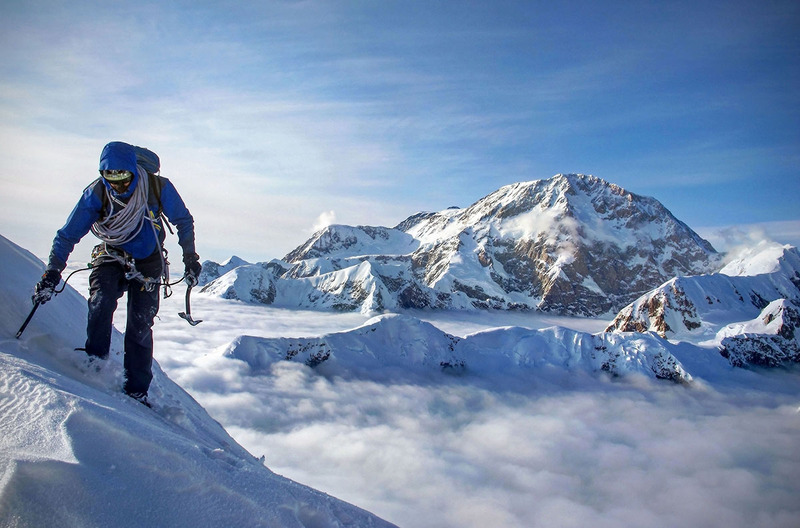 To be sure, it’s harder to move fast with more weight, but serious mountaineering typically does not involve highly technical climbing for extended stretches. It’s more steep walking and basic ice/rock moves, so shaving ounces is not as important as warmth. 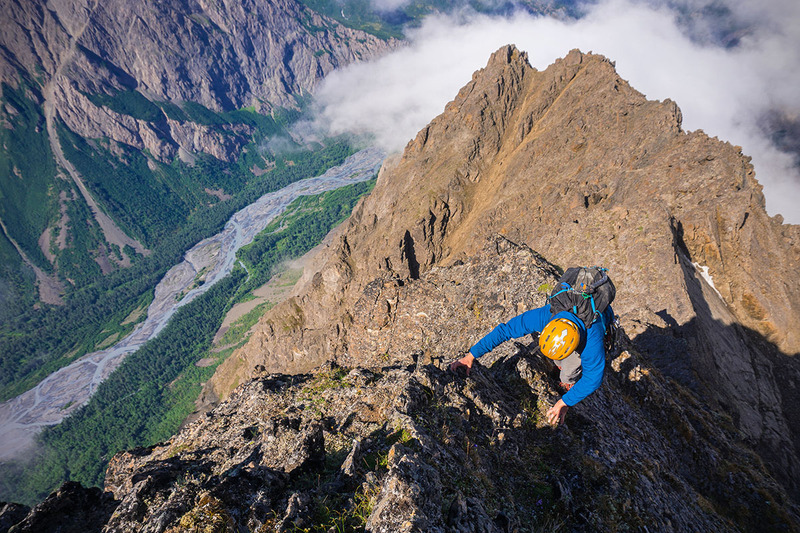 If your aim is technical climbing—pitch after pitch of near vertical climbing—size and weight will likely be a deciding factor in your boot purchase. The good news is that high-end mountaineering boots have cut excessive frills, and although still heavy and bulky, are lighter than even a decade ago. A few ounces or grams may not seem like a big deal, but imagine post-holing through steep snow for 20,000 steps. To quantify this comparison, a 1-ounce difference in boot weight means that each leg will lift an additional 1,250 pounds during that time. The old adage that “ounces makes pounds and pounds are heavy” is especially true in regard to your feet. The only thing worse than losing feeling in your toes is the shooting pain that comes when they warm up. Selecting a boot that will keep your feet warm during the coldest conditions you will encounter is key. Double boots like the La Sportiva Olympus Mons and Scarpa Phantom 8000 are the warmest on the market and will protect your feet on the world’s highest mountains. At the same time, these boots will be overkill at the Ouray Ice Park (but still may work if that’s the only boot you have). On the other hand, Scarpa’s Phantom Tech or Lowa’s Mountain Expert GTX Evo will excel at climbing ice at moderate temperatures but are not meant for extremely cold weather. The truth is, if you plan to do a wide range of climbing from cold and high-altitude peaks to technical summer scrambling, you ultimately will want to invest in at least two pair of boots. The difference is tremendous between double or triple boots built for 8,000-meter peaks and lightweight models that essentially are beefed-up hikers. All have their purposes—and some do a pretty good job at doing it all—but like many types of outdoor gear, having a quiver of options is ideal. Depending on the double boot (remember that single boots don’t have removable liners), liners may provide a significant portion of a boot’s warmth and support. This is the part of the boot that you will want to remove at night during a multi-day trip, and the ability to dry the liner by stuffing it into your jacket or sleeping bag is imperative. Heavy, thick liners made of water absorbing materials will not dry completely throughout an alpine evening, which is why most modern boot liners are constructed of hydrophobic materials like closed-cell foam. Single boots are built with an insulated and often waterproof liner. The most common design by far is a Gore-Tex bootie, although some Scarpa models include an OutDry membrane that is bonded directly to the upper material of the boot. Both designs will allow some breathability, but not nearly as much as a boot without a waterproof liner. In some ways, mountaineering boots need to do their best impersonation of a “quiver of one” type of footwear. In addition to the warmth and protection they provide, they need to be part rock shoe, part hiking boot, and even maybe an occasional ski boot. Having the ability to tighten the boot down when ice climbing or skiing and then loosening it when hiking is essential. Mountaineering boots don’t have lock-down modes like backcountry ski boots, but many now feature an upper and lower lacing system to isolate tightness to specific parts of the boot. Sole stiffness, or stiffness underfoot, also is an important factor to consider—different types of climbing require varying sole stiffness. For low-altitude mountaineering where you won’t be technical ice climbing, you may want a boot with a ¾ shank sole (one that has some flex). These boots will feel like a stiff hiking boot and are better suited for long approaches, technical scrambling, or lower fifth-class rock climbing (like the Cascade’s classic Torment-Forbidden Traverse, for example). On the other size of the spectrum, full shank soles (with no flex) are optimal for technical ice climbing and advanced mountaineering with a step-in/automatic crampon. Tightening your boots down doesn’t just involve basic laces anymore. Modern boots have a wide array of tightening systems including standard tie laces, pull-down cinch laces, or even the high-tech Boa lacing system. Many companies have moved away from standard laces because they are hard to tie and untie in extreme weather. In addition, having the ability to easily tighten or loosen your boots (maybe with only one hand) while wearing thick gloves or mittens is critical. Lacing systems should be simple, but efficient. 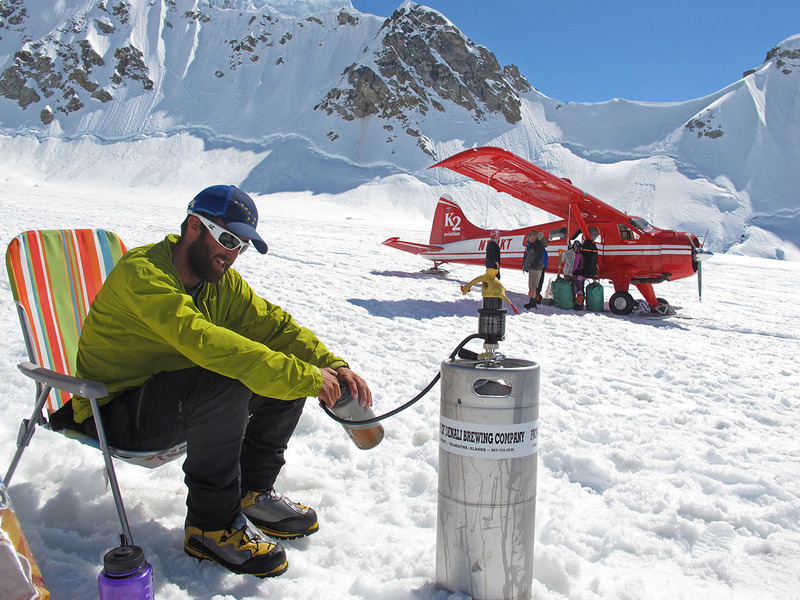 The Boa system is probably the easiest to use, but it may be the most susceptible to breaking in an alpine environment. Luckily, Boa sells repair kits for very cheap and they can be reinstalled in about the same amount of time as it would take to replace a shoelace. 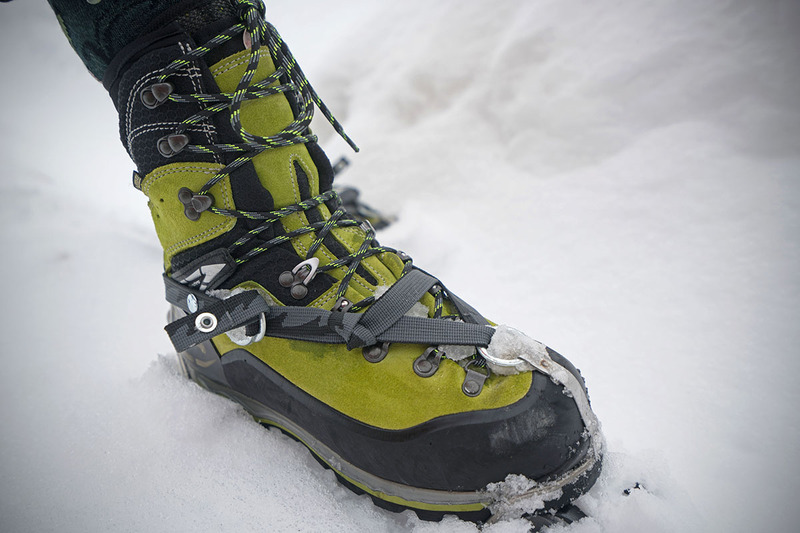 For each boot, we’ve specified whether or not it is compatible with a step-in crampon. 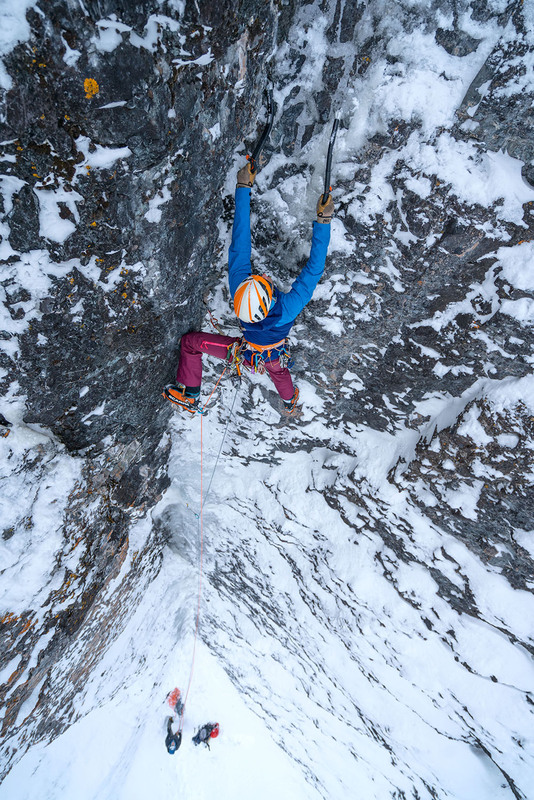 A step-in crampon—also known as an automatic crampon—uses a wire toe bail and heel clip to provide the most secure attachment, ideal for ice climbing or technical mountaineering. 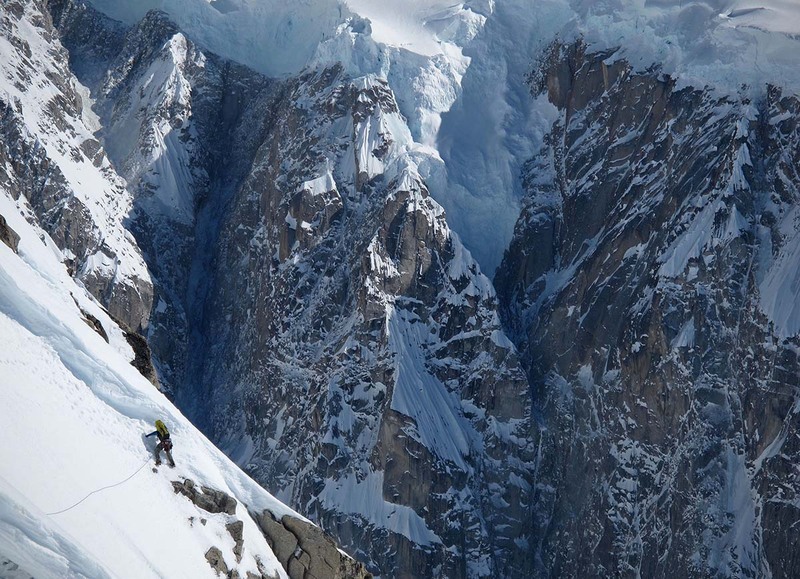 If we’re climbing anything that is remotely approaching vertical, we want a step-in crampon. In order to be compatible with a step-in crampon, a boot must have toe and heel welts and a fairly stiff build that provides a stable structure for the crampon. Every double boot on this list is compatible with a step-in crampon. More flexible, streamlined single boots often forgo the toe welt and otherwise shave weight by having a thinner last. The majority of these models—such as the La Sportiva Trango Cube GTX—still have a heel welt, which is essential for compatibility with a semi-automatic crampon (also known as a hybrid crampon). A semi-automatic crampon combines the front plastic loop of a strap-on crampon (see below) and the heel clip of a step-in crampon. 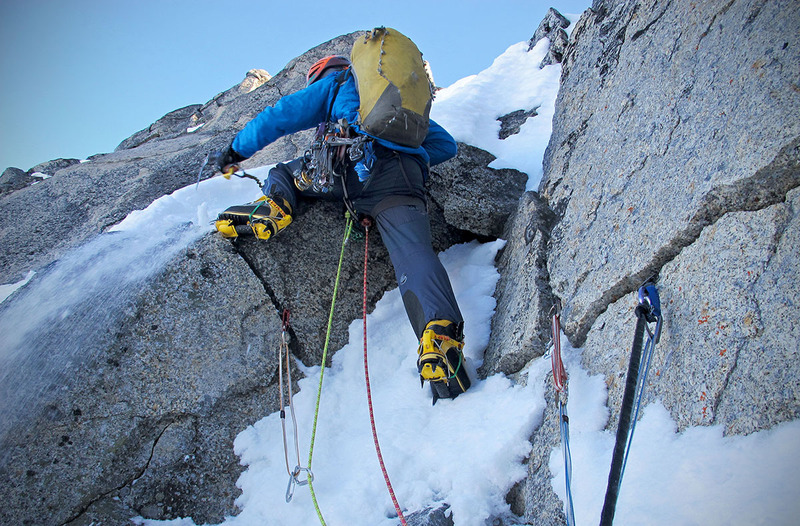 While less secure than a step-in crampon, semi-automatic crampons are a far better choice for lightweight or flexible boots as they have more of an ability to move with the boot. The last type of crampon is a full strap-on crampon (plastic loops in front and back with webbing to tighten). Strap-on crampons are highly adaptable, and even are capable of fitting on lightweight approach shoes. They do have limited technical performance, however, as they do not secure as tightly to the boot as a step-in or semi-automatic crampon. Strap-on crampons can be attached to any sort of boot, although they would have very compromised functionality when paired with a stiff build, and are not appropriate for ice climbing or technical mountaineering. The lesson here is: make sure your boot can accommodate the type of crampon you need, and don’t forget to check compatibility and fit before any big trip. If you ever plan on climbing a mountain like Denali where you may use your mountaineering boots with skis (utilizing bindings such as the Silvretta 500), it’s essential that your boot have both a heel and toe welt. These are the flat rails on the front and back of the boot that serve as the connection point for crampons and a few types of ski mountaineering bindings. Every full shank mountaineering boot currently on the market has this feature. Different companies use different lasts for their mountaineering boots. Some tend to be slightly narrower (La Sportiva and Arc’teryx) while others routinely have a slightly boxier feel (Scarpa). Just because you wear a size 44.5 street shoe, doesn’t mean that it will translate directly into a big mountaineering boot. You may be a 44.5 in La Sportiva, a 44 in Scarpa and a 45 with a thick insole in Arc’teryx, for example. And every boot has a unique fit and it can take some work to dial it in. Always try on your boots well before a trip—a little extra heel room quickly can develop into a show-stopping blister that keeps you from reaching the summit. Or a tight toe box can restrict blood flow and lead to frostbite. Your feet swell as you stand on them, so we recommend trying boots on in the afternoon after you have been walking around for a few hours. Mountaineering involves long days (often back to back for a week or more) carrying heavy packs and using your feet in dynamic ways. Accordingly, an insole is the first line of support in your boot. Custom boot fitters will say, “If you buy a $1,000 boot, throw away the $0.10 insole.” Often that is true, although companies like La Sportiva and Scarpa seem to have taken note. Many of their boots now come with quality insoles that not only offer support and comfort, but a bit of additional warmth as well. A good insole should support your foot, both in terms of supporting your arch and cupping your heel. If the included insole doesn’t work for you, consider spending another $40 to 50 for a heat-molded insole from a reputable brand like Sole or Superfeet. Aside from providing additional warmth, these insoles come in a variety of thicknesses that can take up space if there is a little too much room (or even work out tight spots). And when making a boot purchase, it’s always better to go slightly bigger as opposed to going too tight—it’s easier to take up room than to make it. As with other types in climbing footwear, the most important thing in choosing a mountaineering boot is fit. Most of the models listed above technically are unisex, while a few like the La Sportiva Nepal Cube GTX, Scarpa Charmoz, and Scarpa Mont Blanc Pro GTX also come in women’s-specific versions. It’s extremely common for women to wear unisex boots—again, it’s all about fit and only a handful of models are even available in women’s versions. It’s also worth noting that La Sportiva and Arc’teryx tend to run narrow, which at least in theory, should be more akin to the shape of a women’s-specific design. There’s an old adage in the outdoor gear world: “between light, durable, and cheap, you can pick two of the three.” Over the last decade or so, mountaineering boots have seen a tremendous jump in precision and technical design, while also cutting some weight. Unfortunately, this has come at the expense of durability to some extent. Plastic boots were almost indestructible, but they could feel rather clunky at the same time. New-age double boots like the Scarpa Phantom series or La Sportiva Spantik are technical climbing machines with rock shoe-like precision and a high level of warmth. This is attained by using ultralight polyurethanes, foam, and synthetic fabrics, but these materials are much less durable than the plastic boots of old. One of our Alaska testers has found that his high altitude technical double boots last him about three years (but he averages 60 days of abusive use per year). Is the tradeoff of less durability and a higher price for lower weight and more technicality worth it? We think so. The average mountain climber will get many years of use out of their boots. If you practically live in your boots, you will appreciate the greater flexibility, technical prowess, and lower weight. And for those who prize durability above all else, there’s always a trusted work horse and plastic double boot like the Scarpa Inverno.